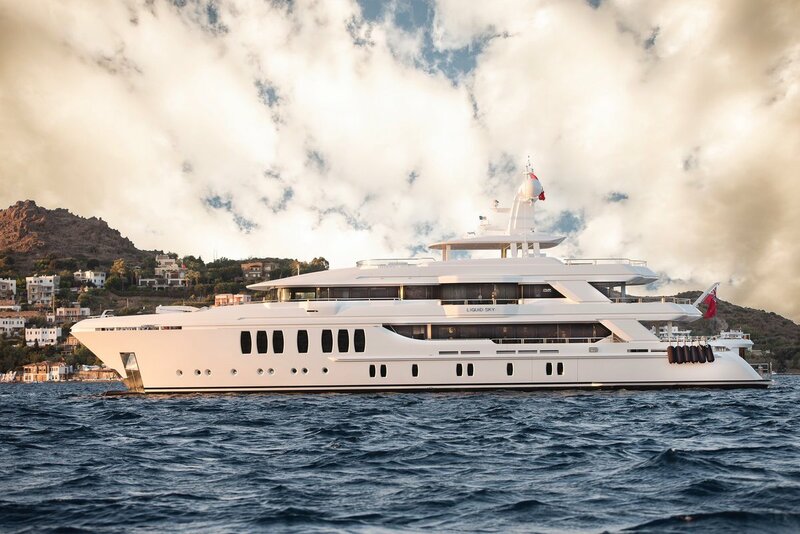 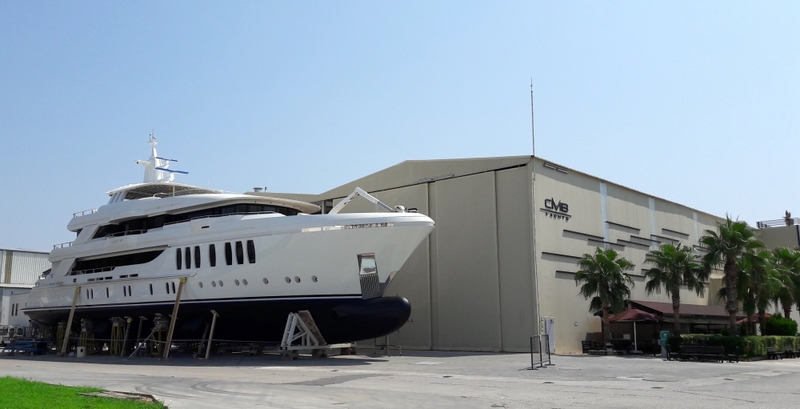 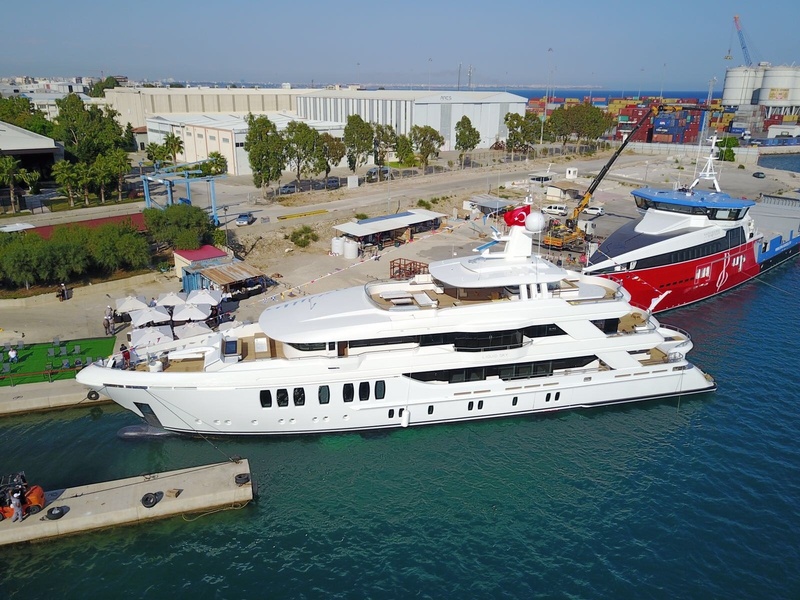 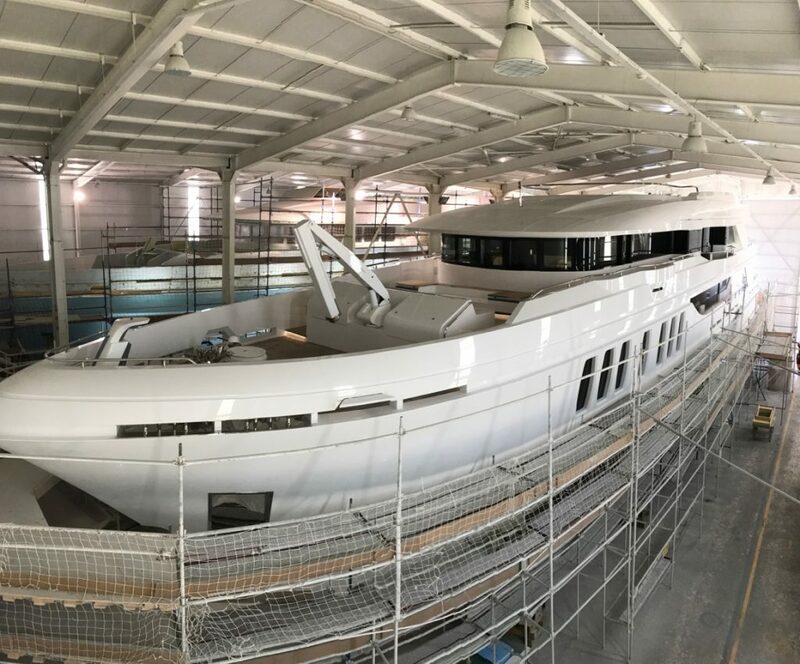 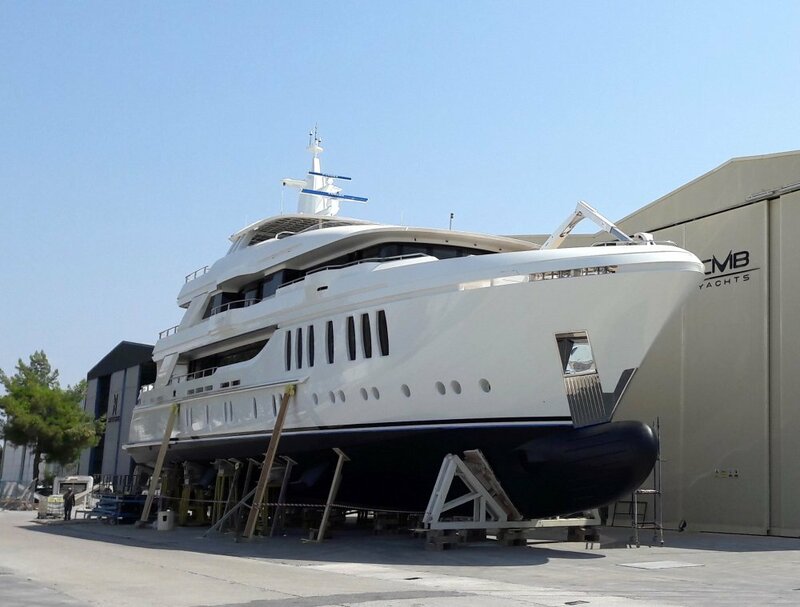 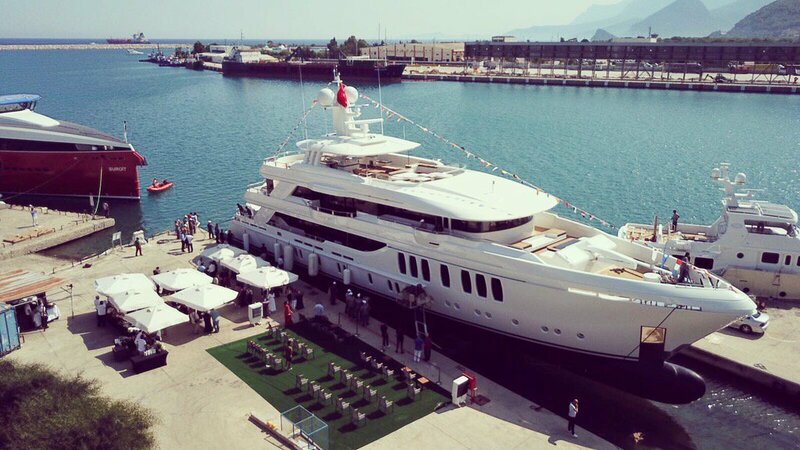 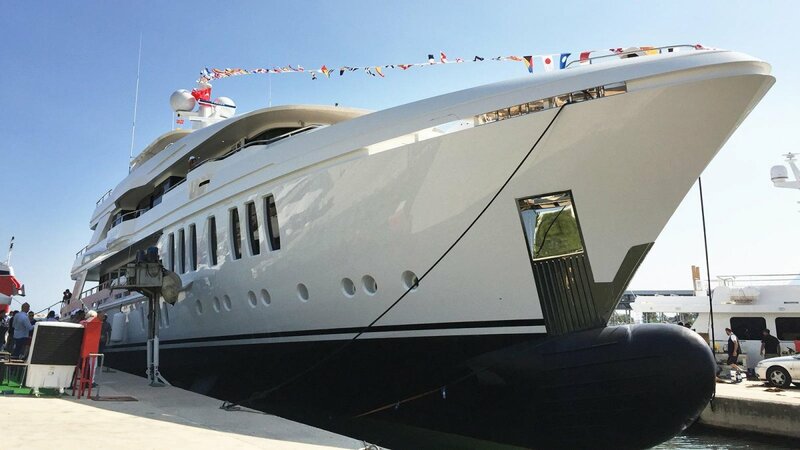 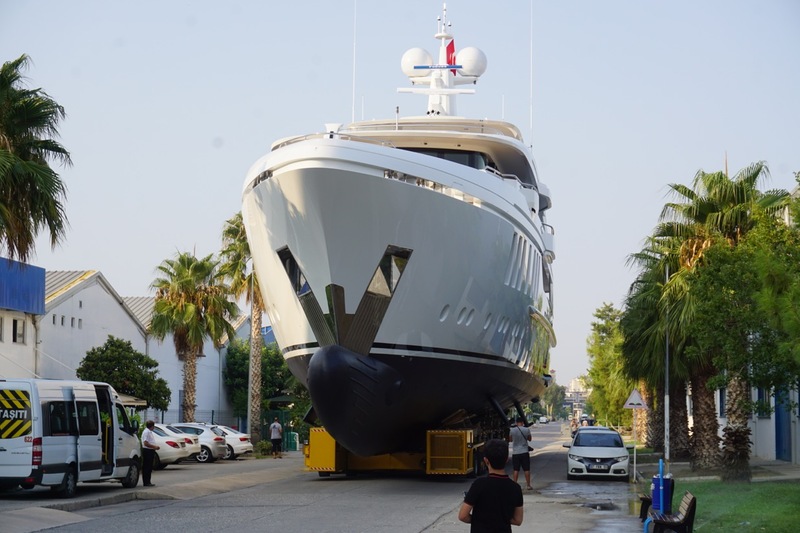 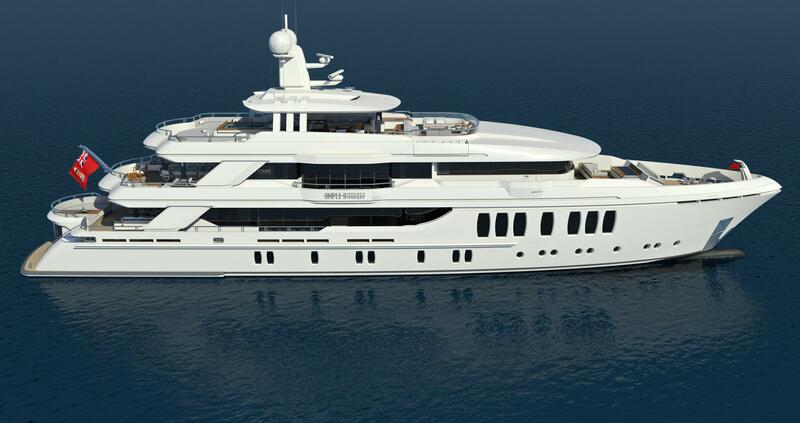 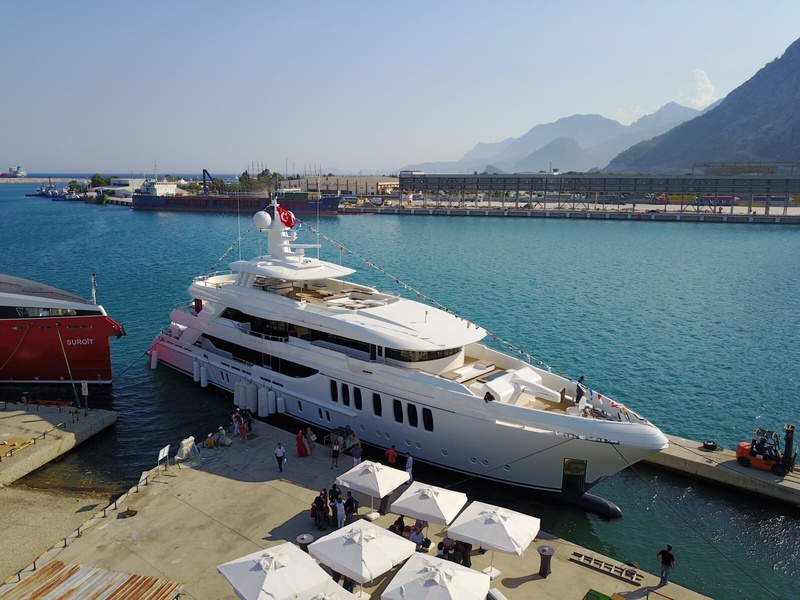 Luxury motor yacht LIQUID SKY was launched in 2017 by CMB shipyard and measures 47.00m (154' 2"). 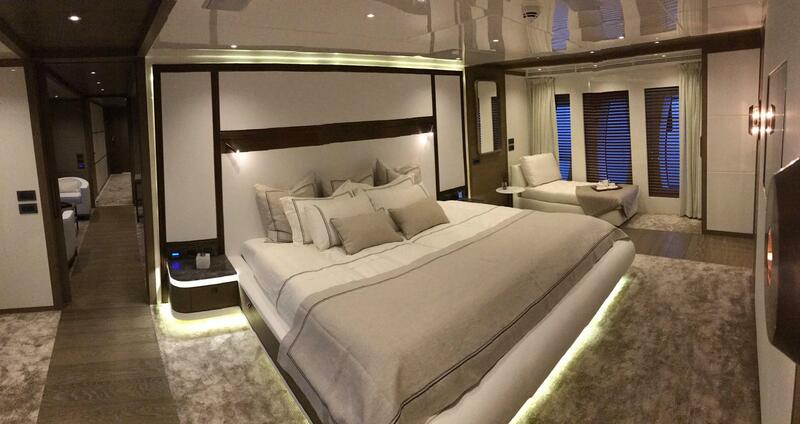 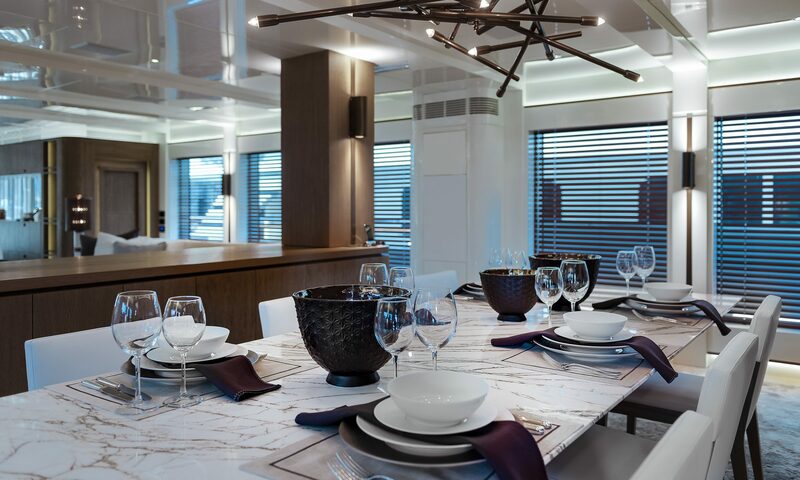 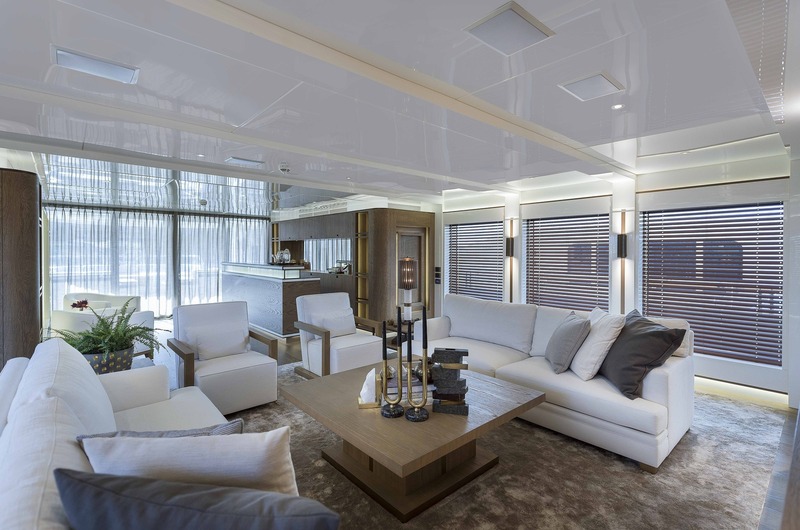 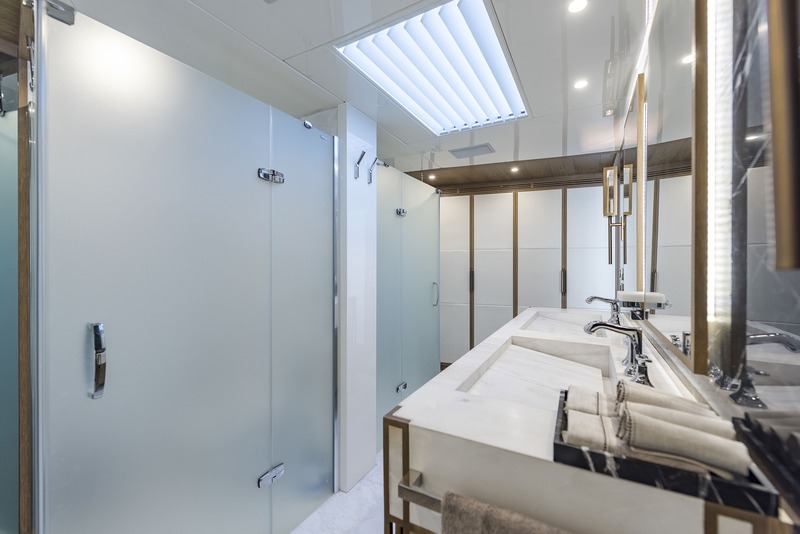 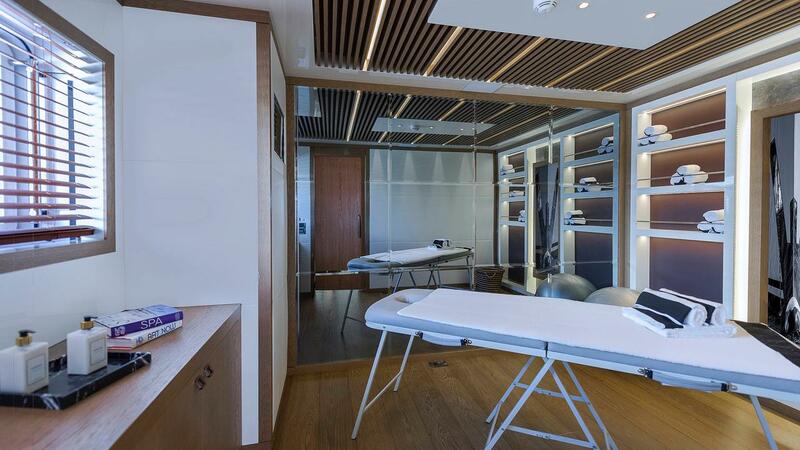 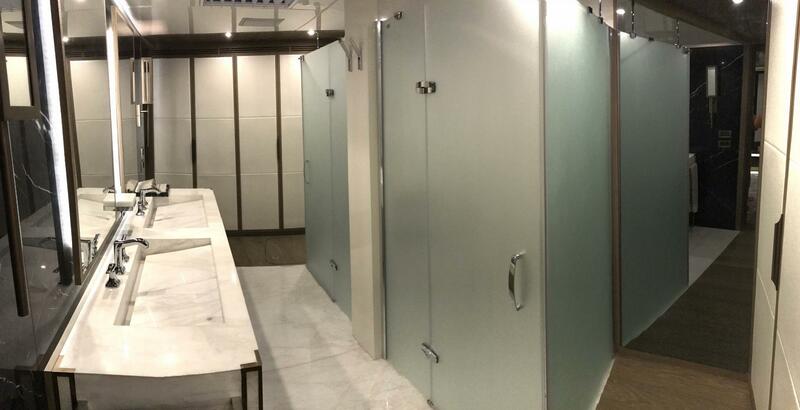 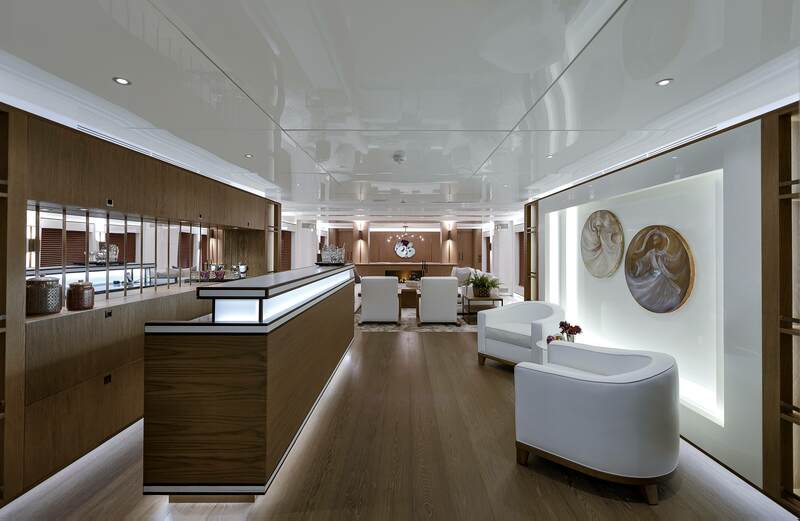 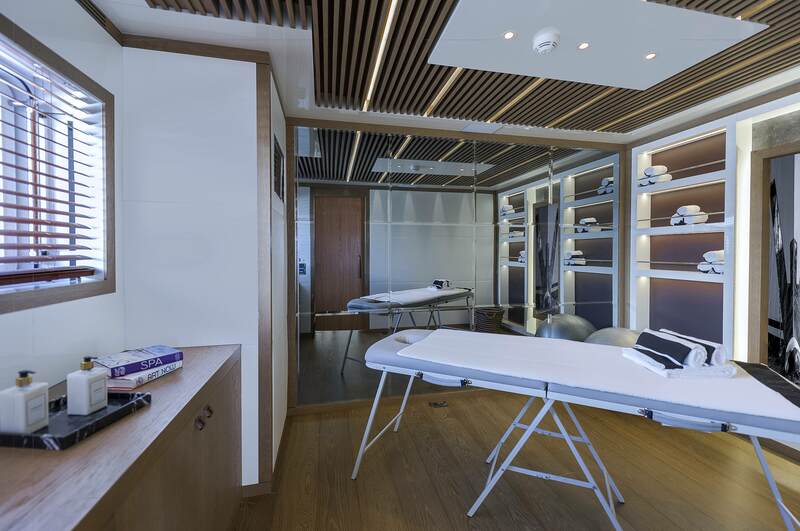 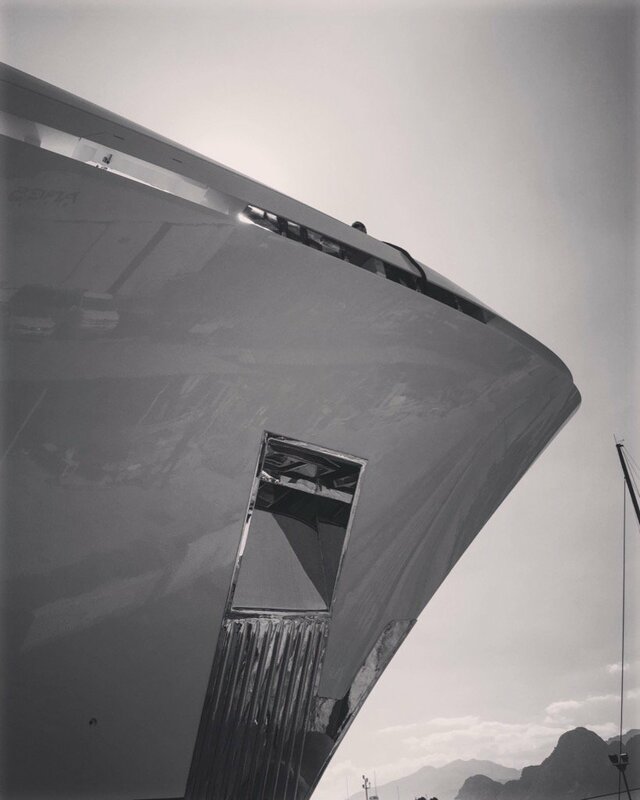 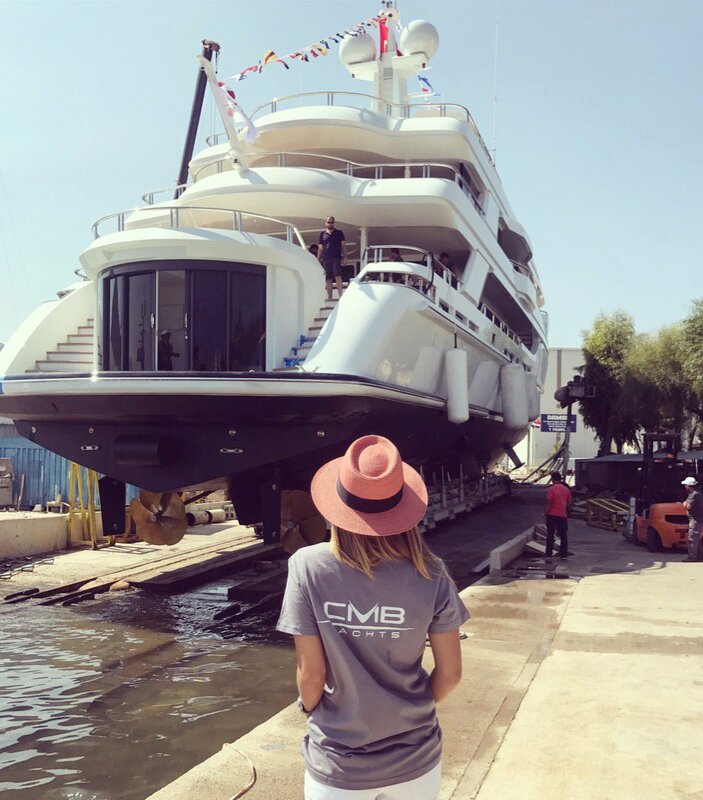 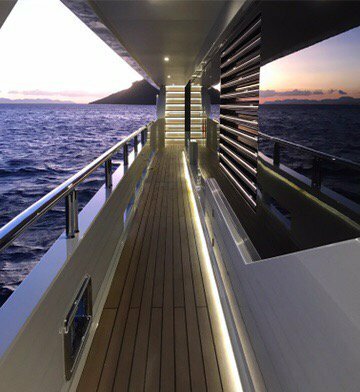 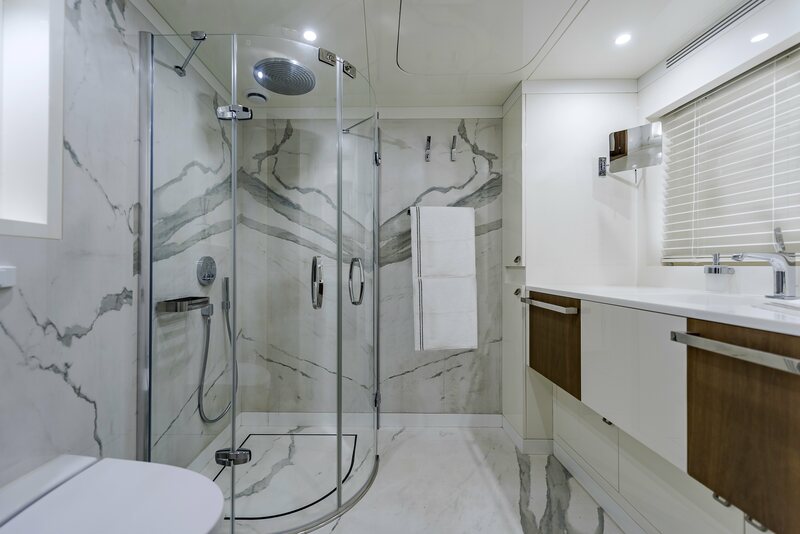 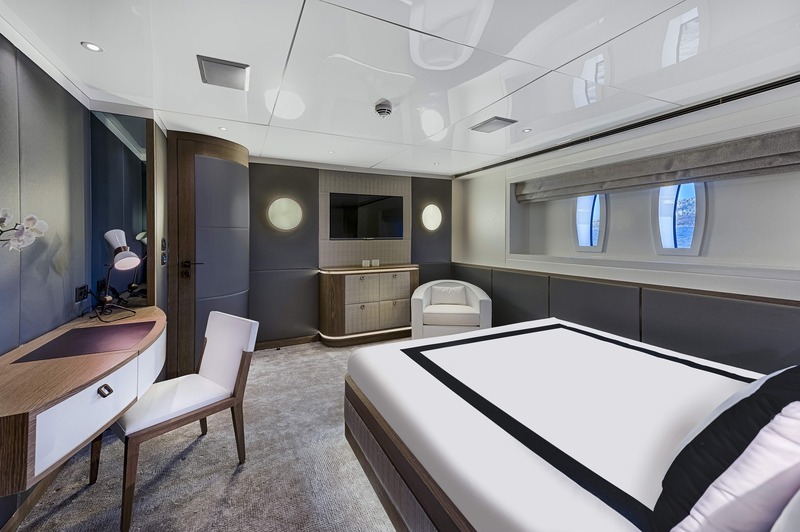 Her naval architecture is by CMB Yachts, while her interiors are the work of Arte-Bel Design Studio. 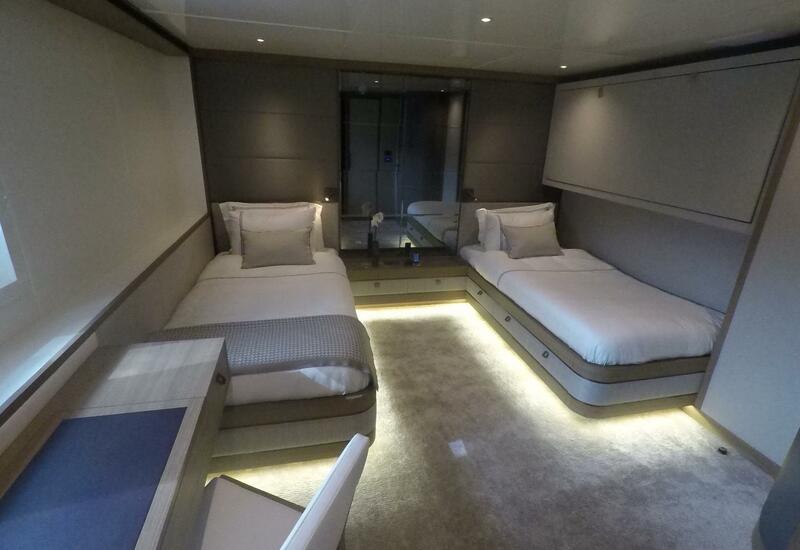 She offers accommodation in 5 cabins, for up to 12 people. 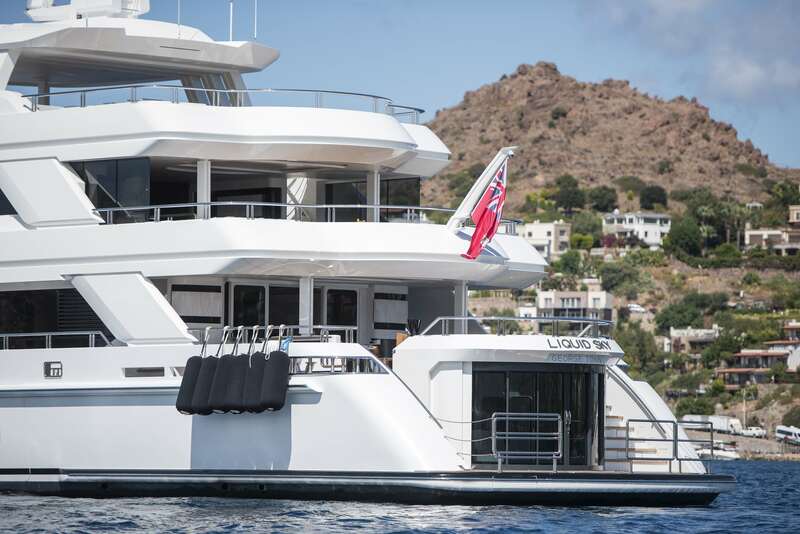 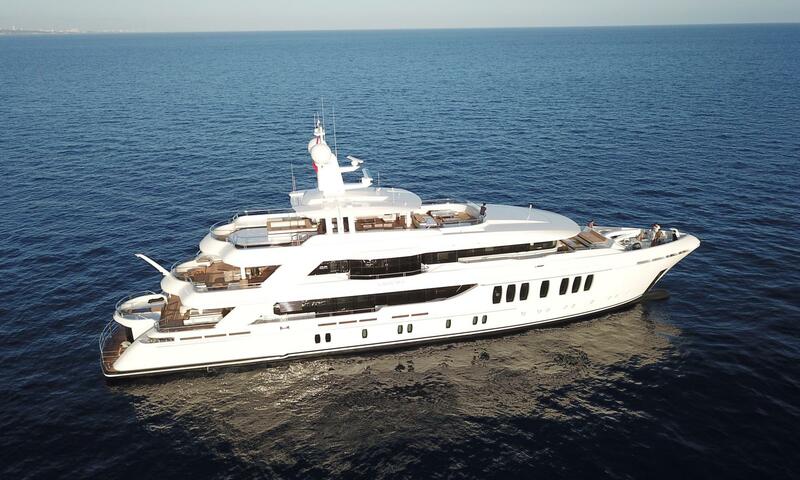 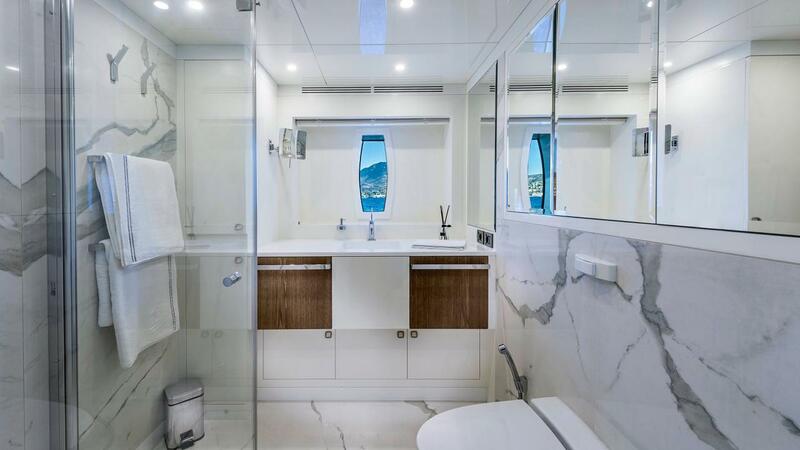 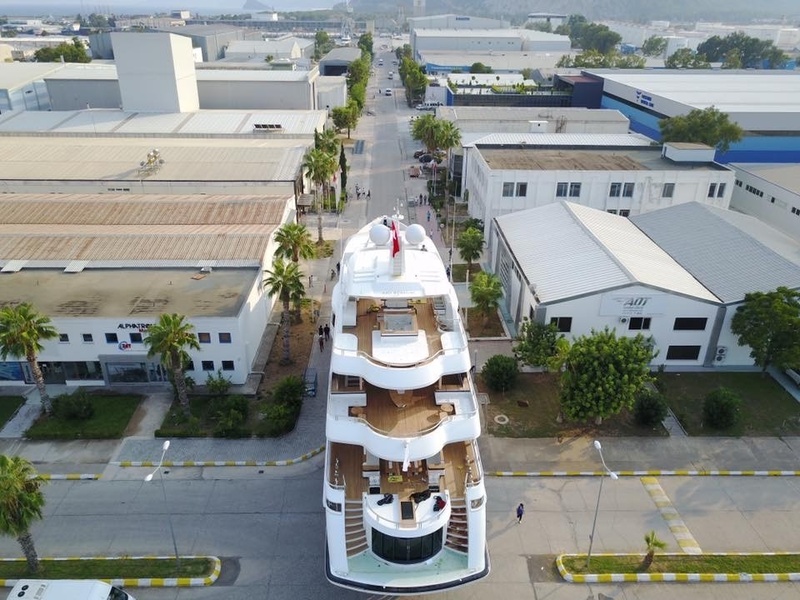 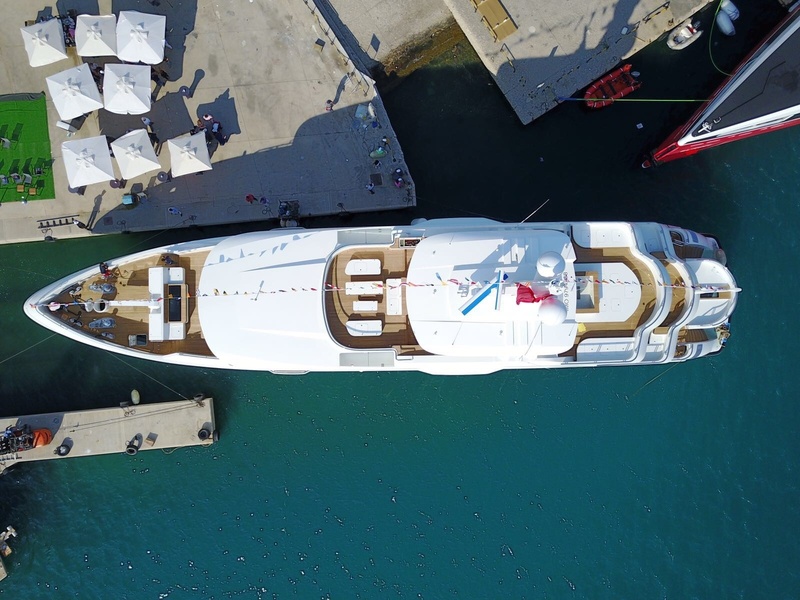 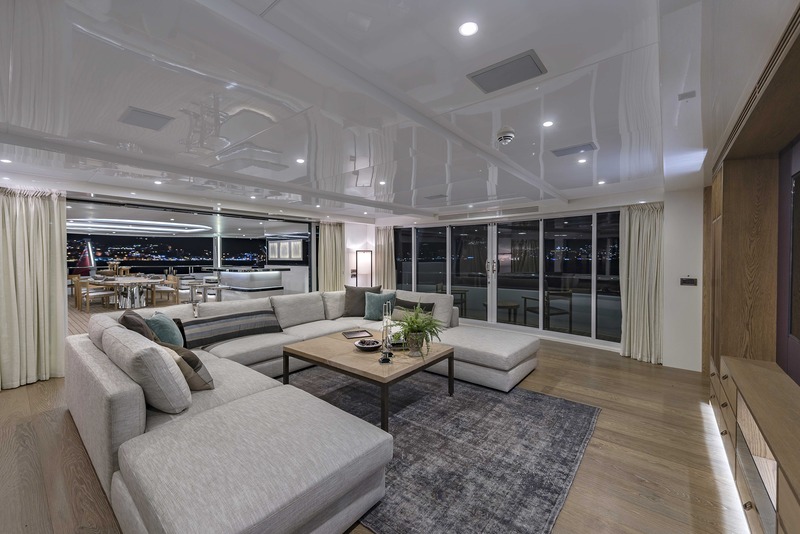 NOTABLE FEATURES: ~ A well-balanced design by Espen Oeino ~ Immense space on board, that gives you feeling of being on 70 m yacht ~ Professionally equipped gym ~ 180º fully open sky lounge with balconies ~ Jacuzzi with waterfall ~ Jacuzzi ~ Beach club ~ Warm but modern interior woodwork. 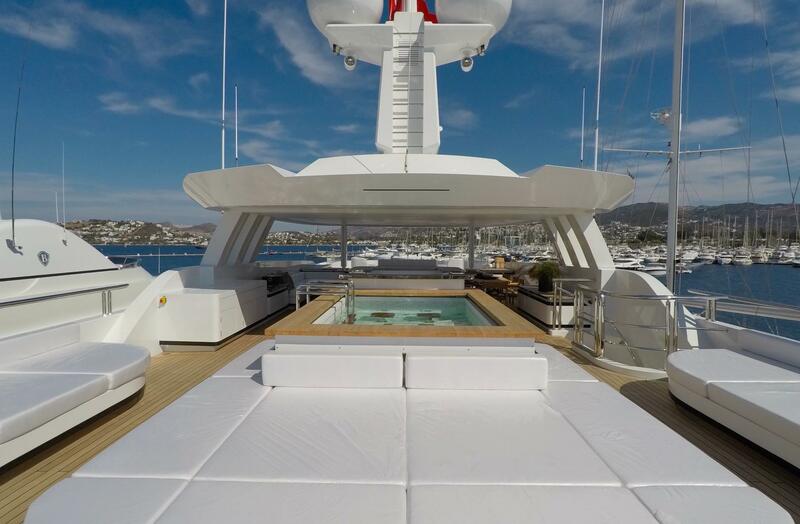 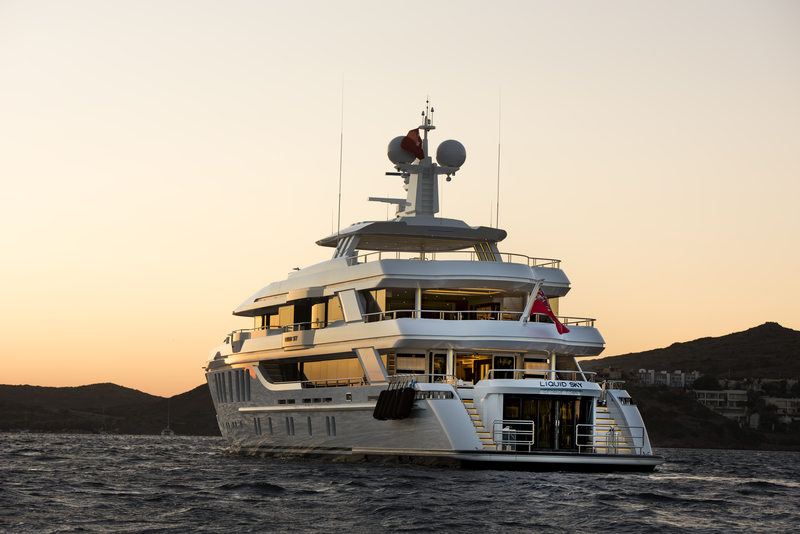 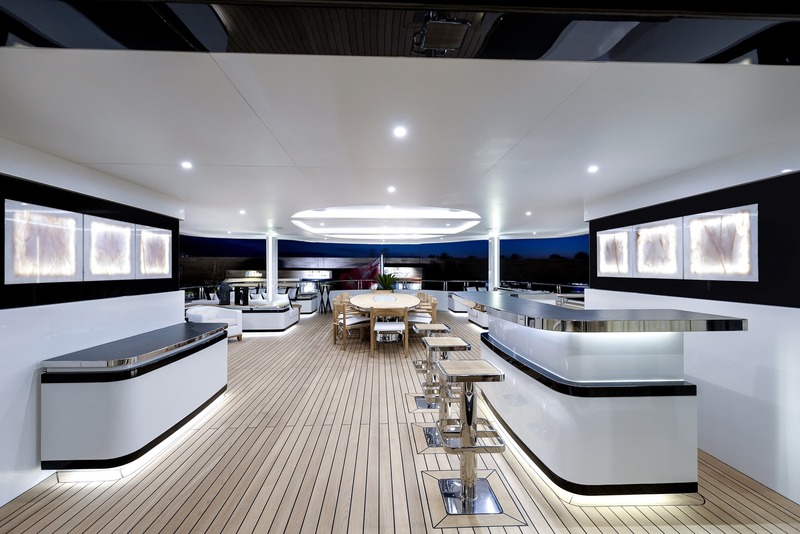 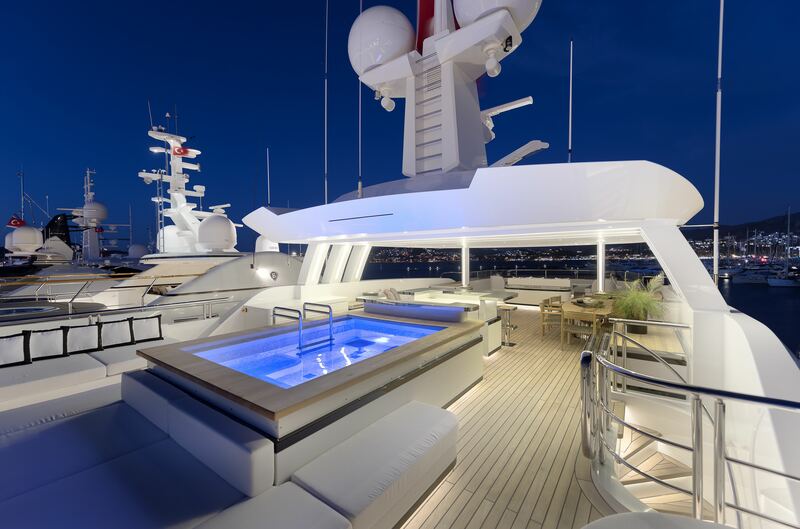 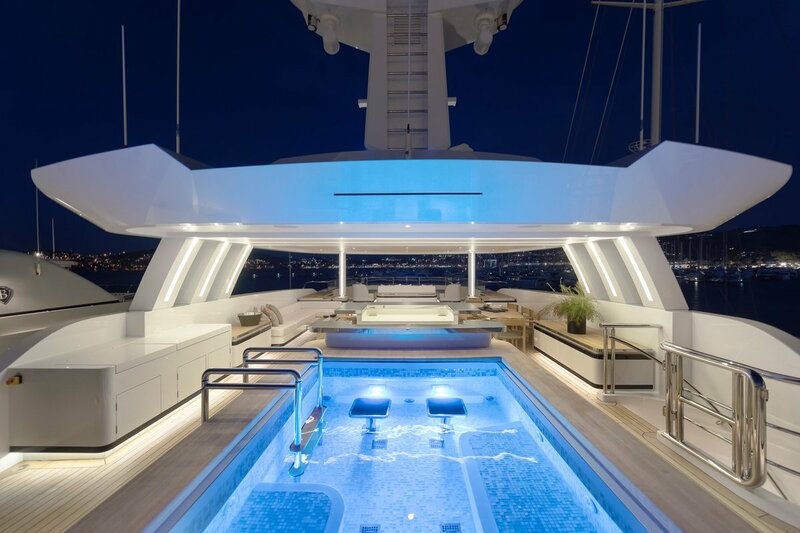 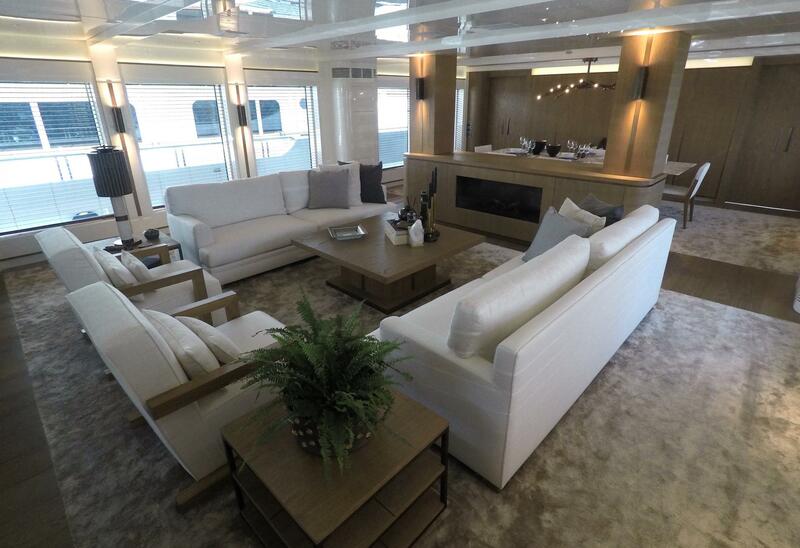 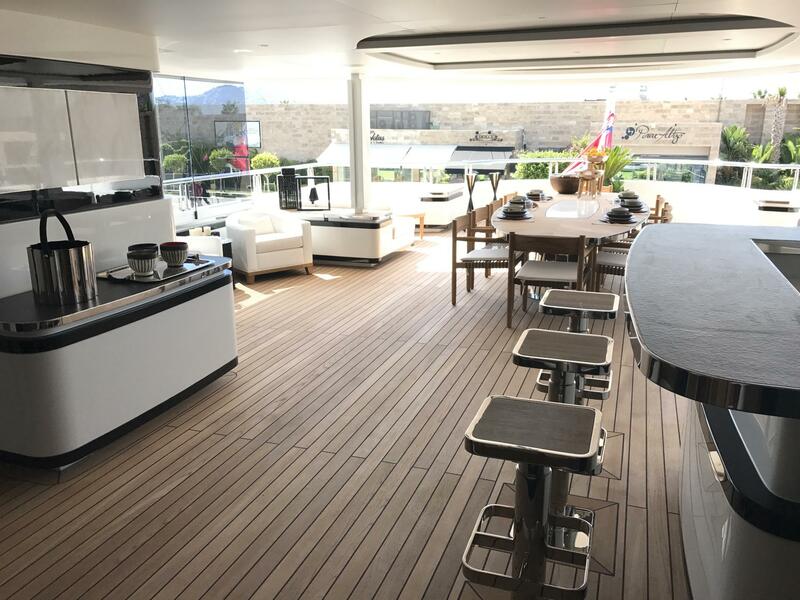 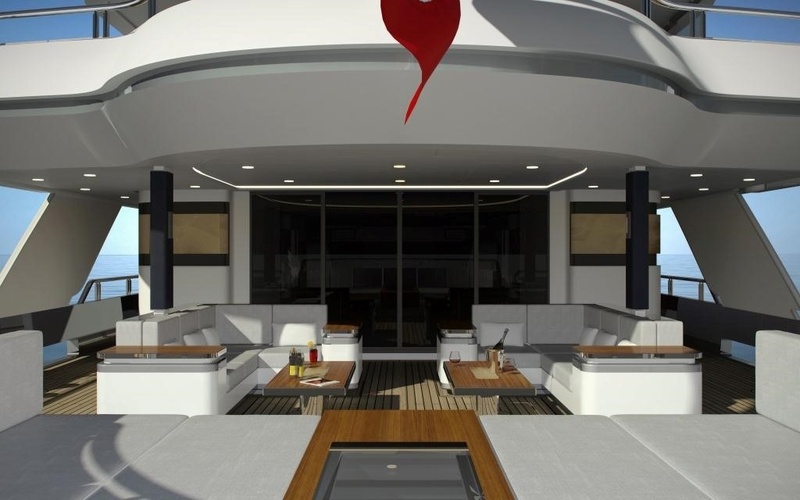 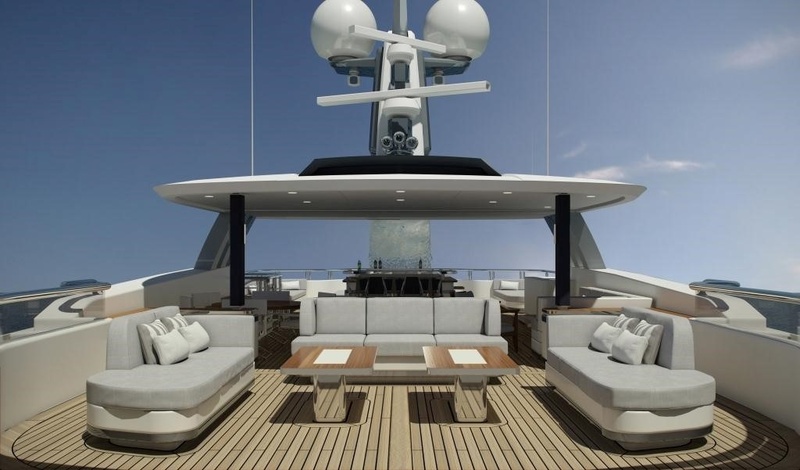 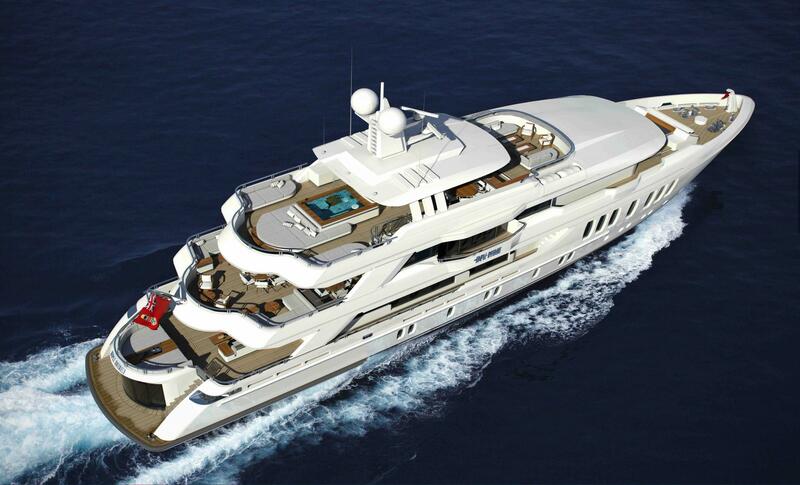 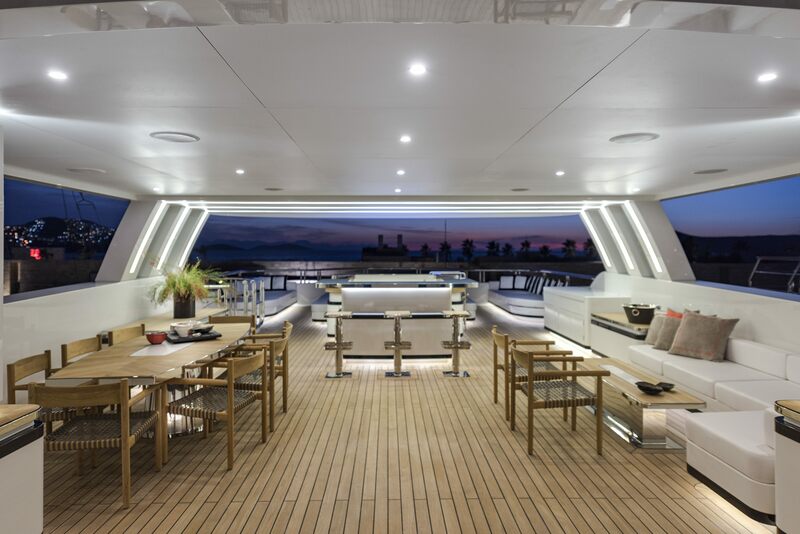 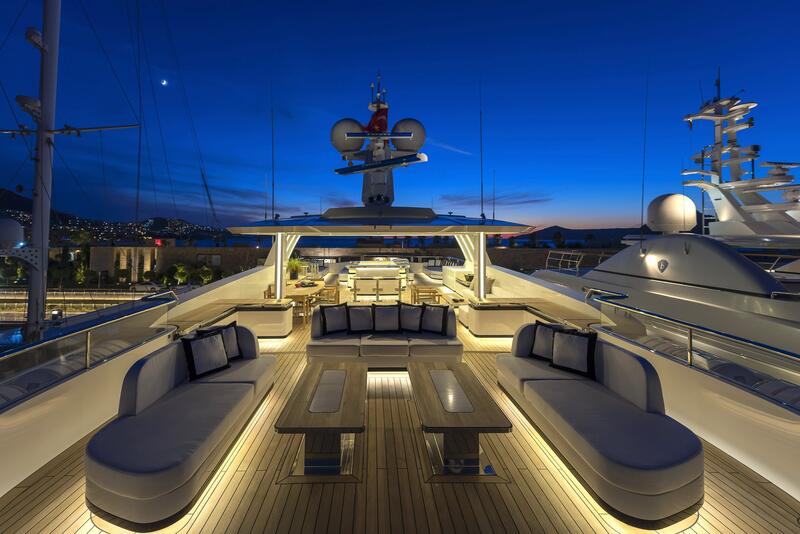 On the main deck is a shaded aft area with exterior lounge, ideal for evening cocktails and entertaining during the day. 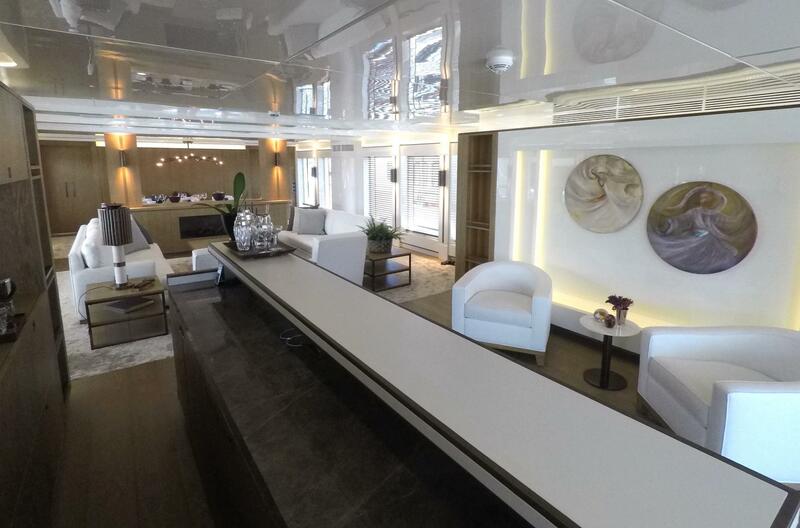 Glass doors lead into the foyer and wet bar, followed by the generous salon with ample lounge area. 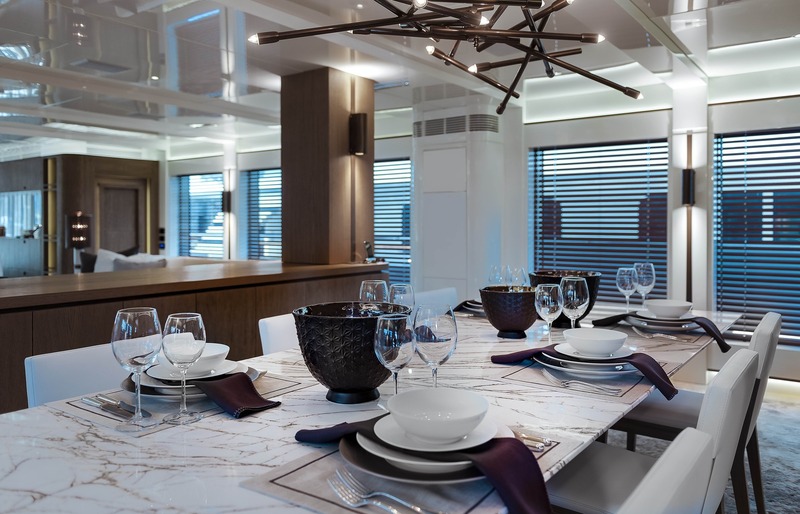 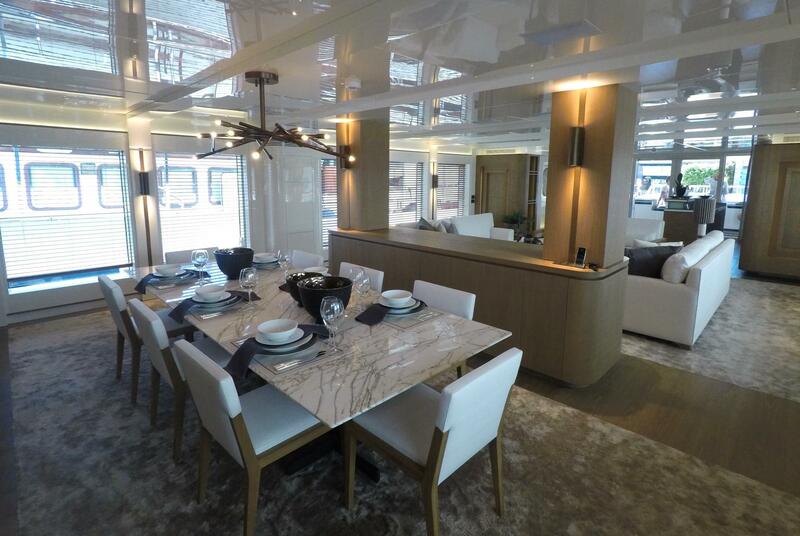 Forward to the salon is the formal dining table seating guests in elegance. 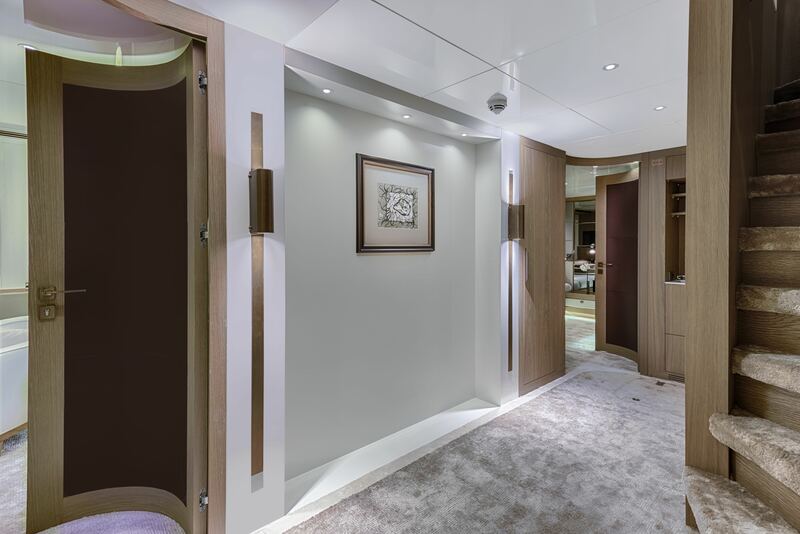 A foyer to starboard leads to the full beam master stateroom, furnished with a king size bed. 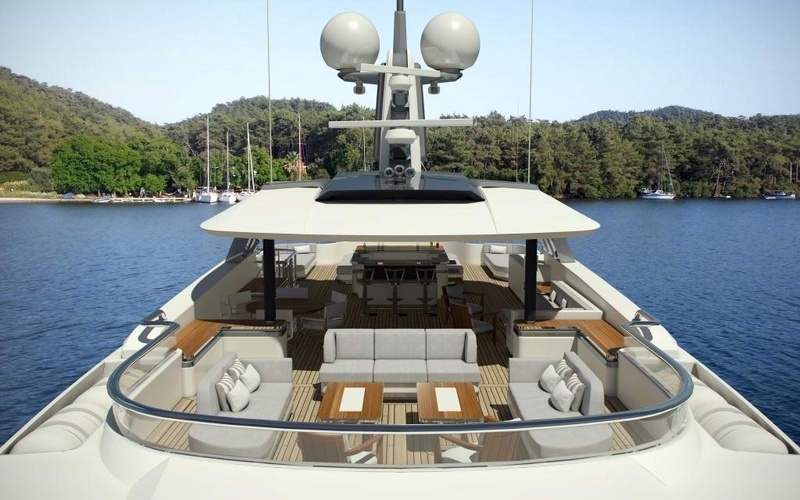 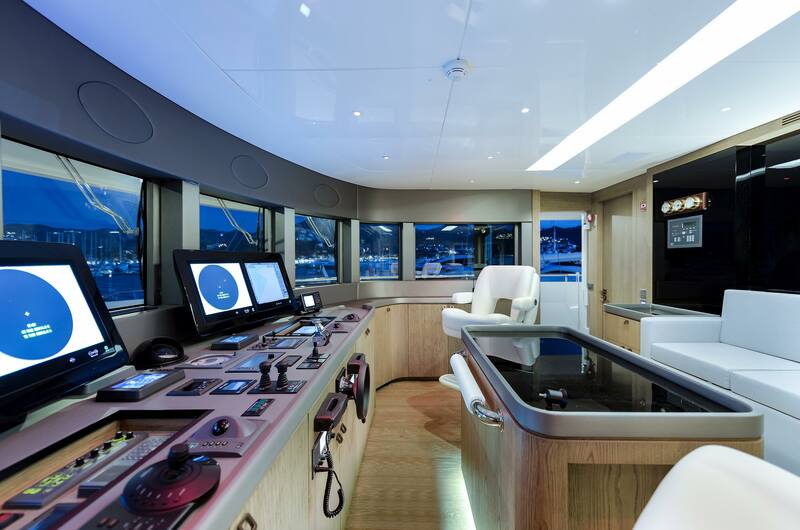 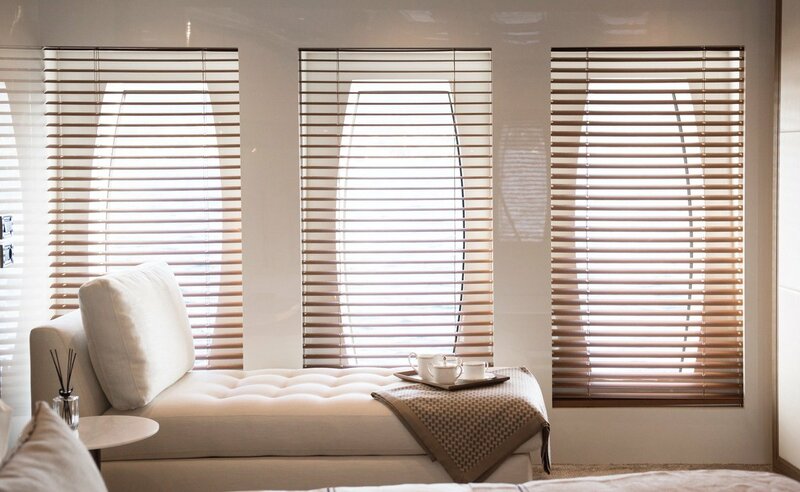 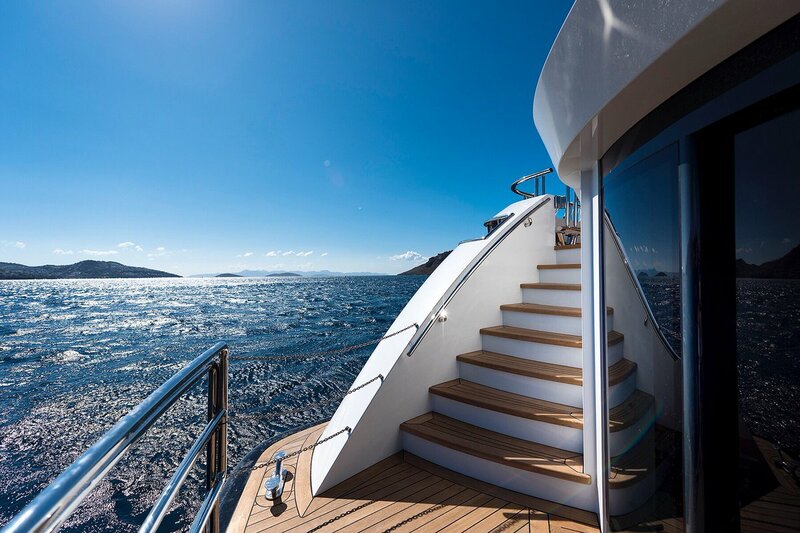 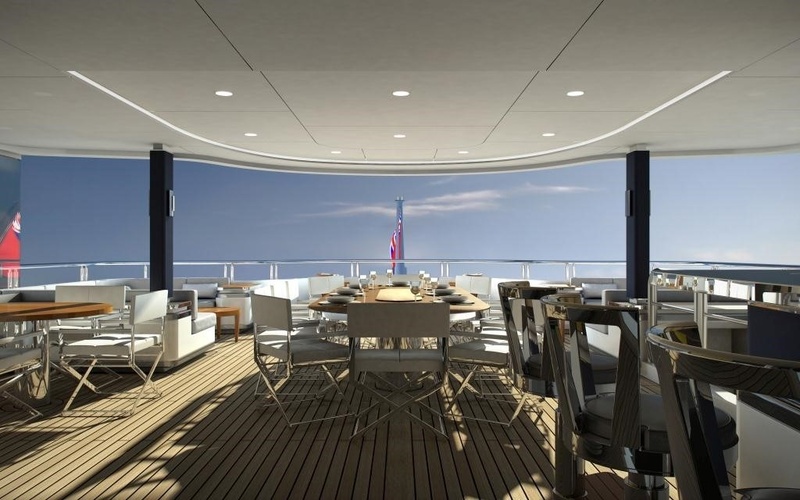 The main deck boasts panoramic windows throughout ensuring optimum natural light. 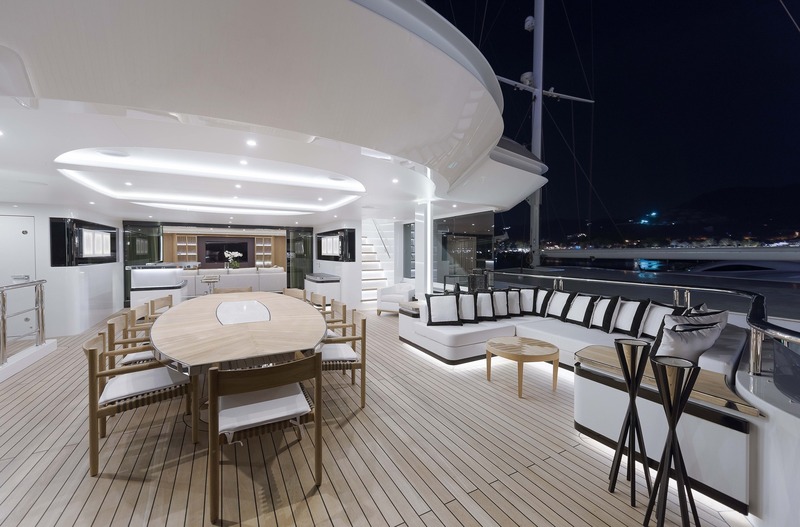 She boasts an exterior design by Espen Oeino while her interior is decorated with oak wood, bronze, corian and light tone fabrics. 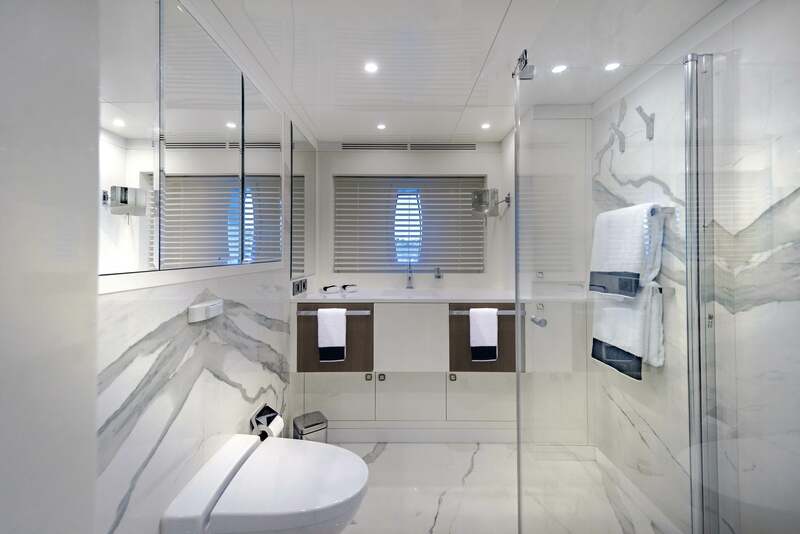 She offers five en-suite bedrooms with sleeping occupancy for ten guests as well as a professionally equipped gym, 180º fully open sky lounge with balconies, Jacuzzi with waterfall, beach club and much more. 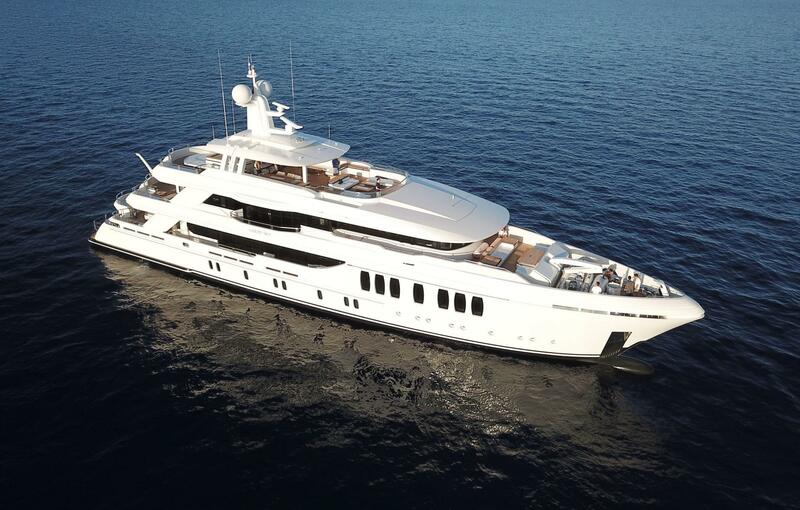 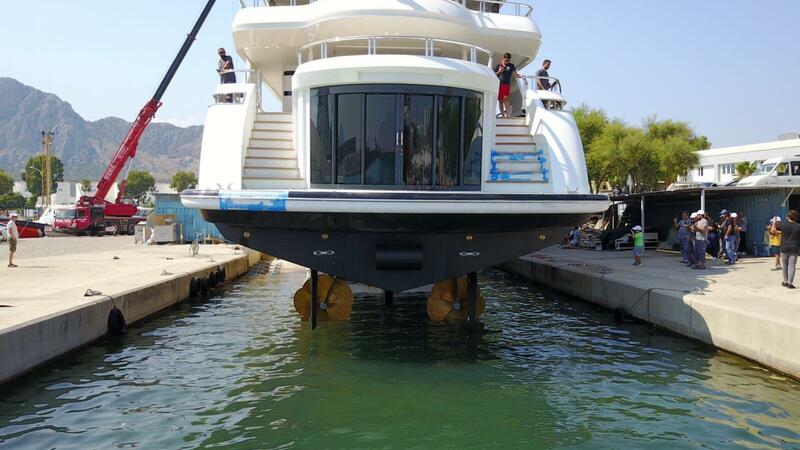 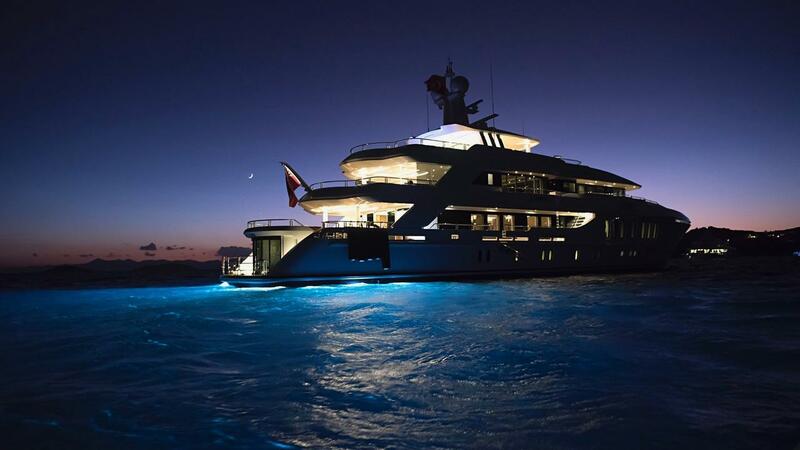 She is outfitted with the latest in electric technology and entertainment. 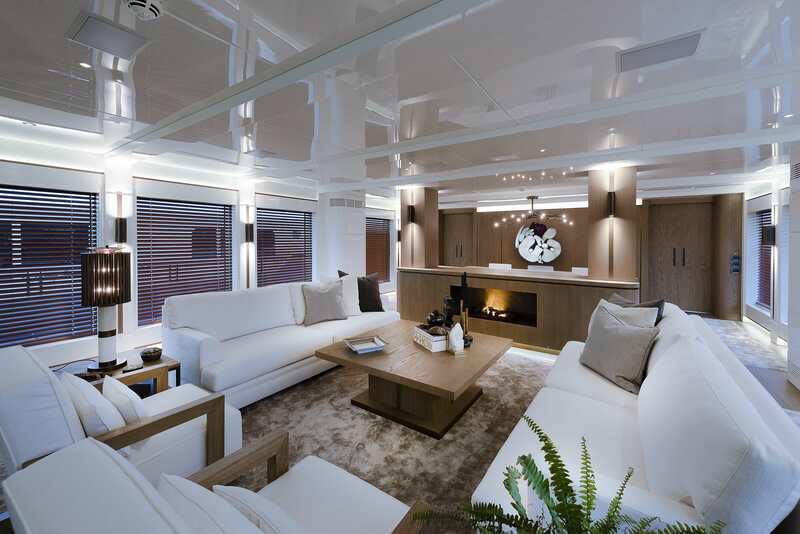 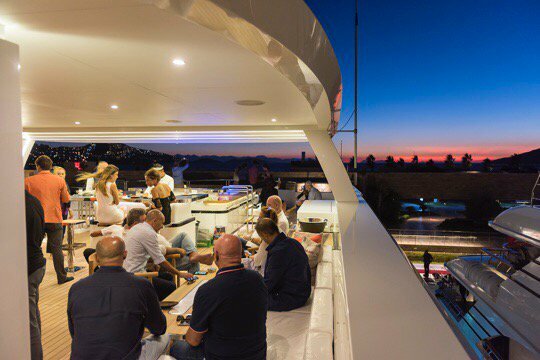 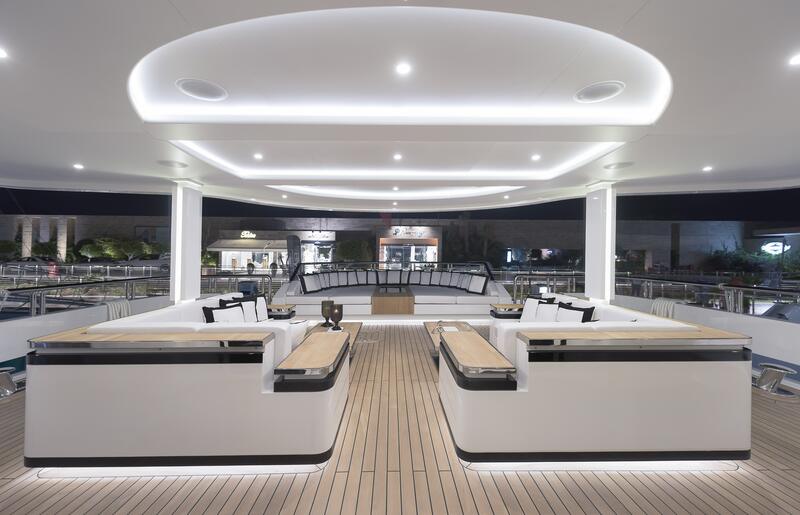 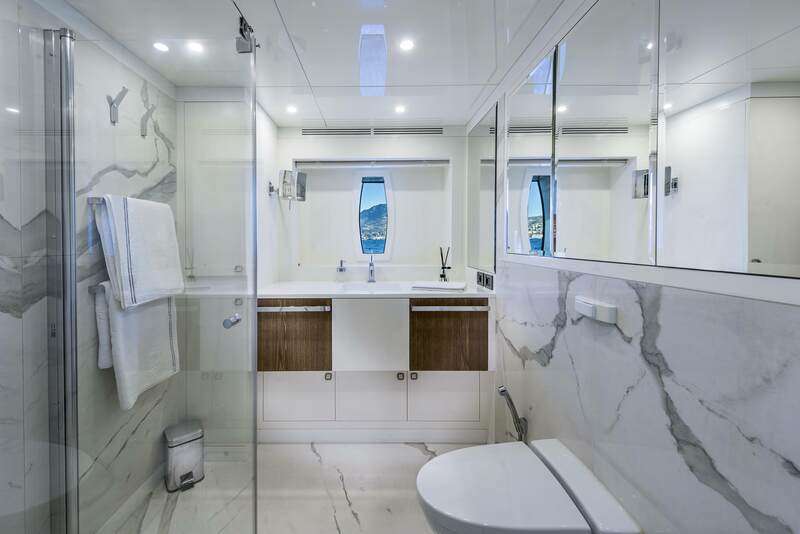 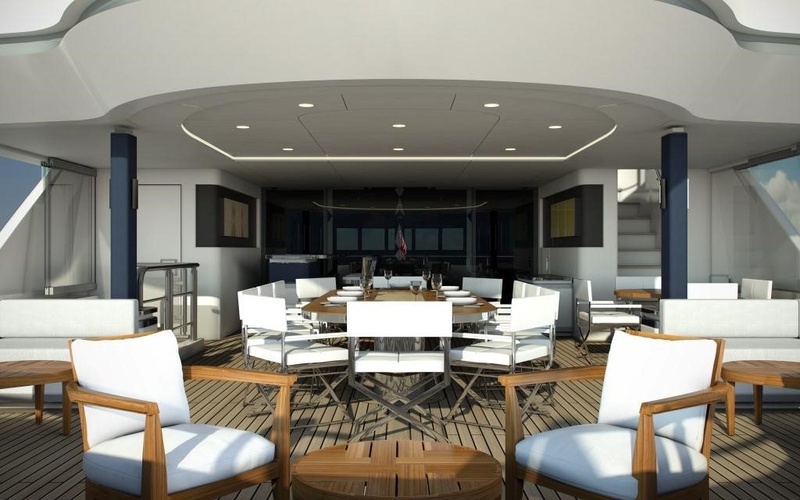 The CMB yacht LIQUID SKY's upper deck features a well-appointed exterior living space complete with wet bar, alfresco dining, seating, sun pads and partial shade. 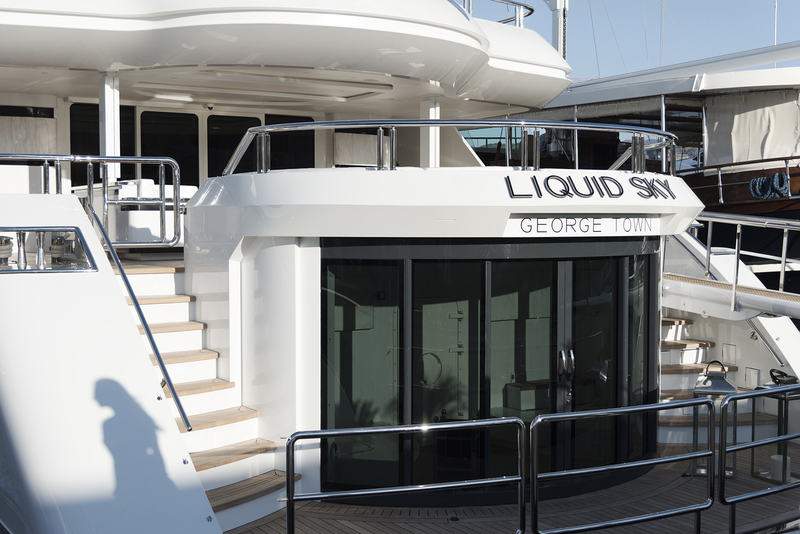 This deck has direct access to the sky lounge, where an additional salon invites a relaxing atmosphere. 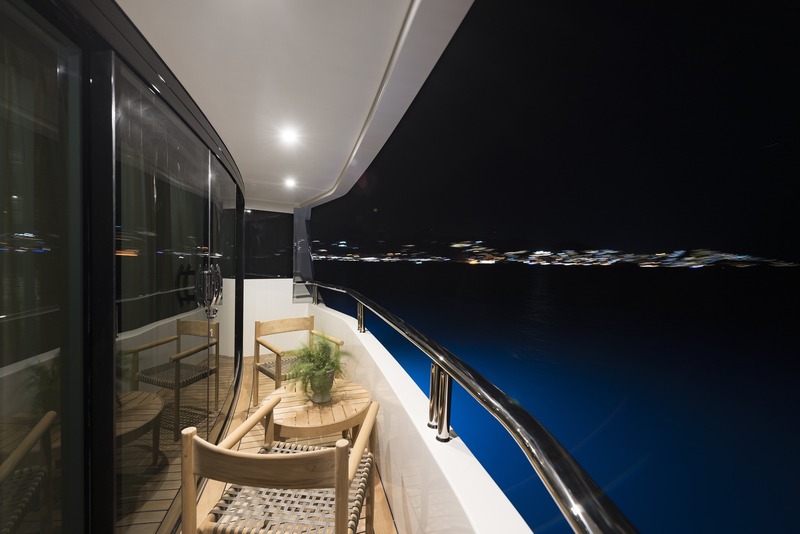 The sundeck offers stunning views from the numerous seating areas, plenty of space to soak up the sun on the large sun pad, and in addition, features a deluxe Jacuzzi with a waterfall. 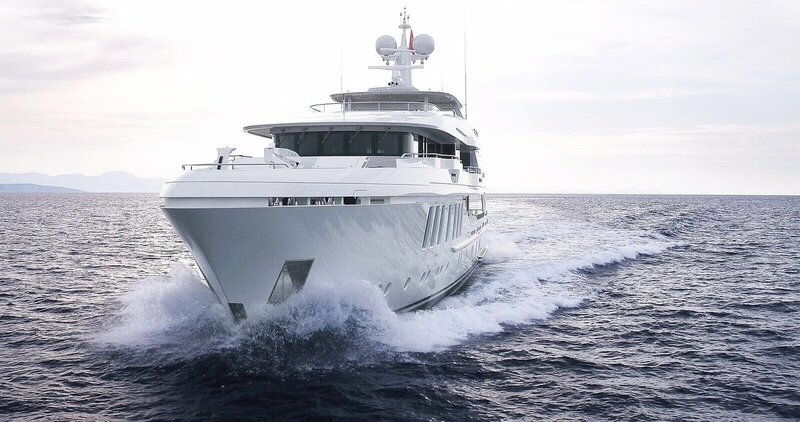 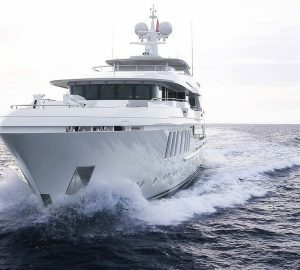 Powered by 2 CAT 1,450hp engines, the GRP displacement yacht LIQUID SKY cruises at 12 knots and has top speeds of 16 knots. 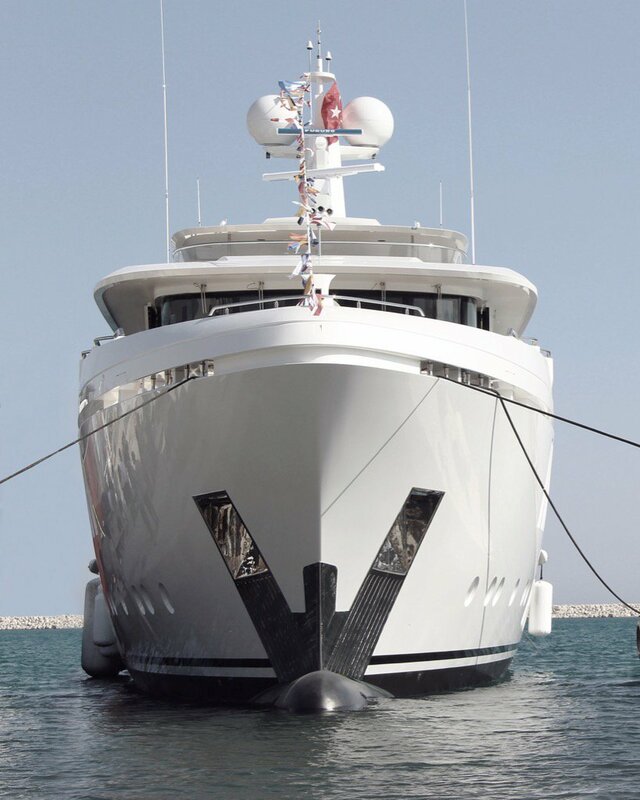 She is fitted with state of the art stabilization systems, both at anchor and underway. 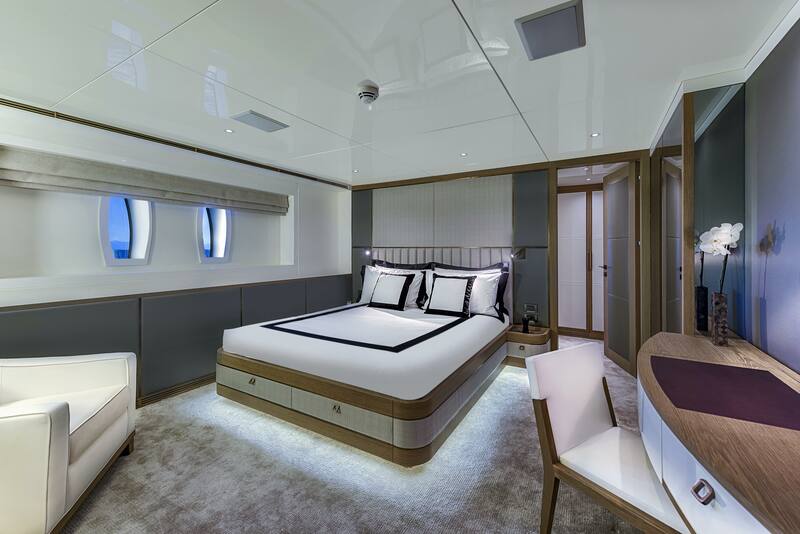 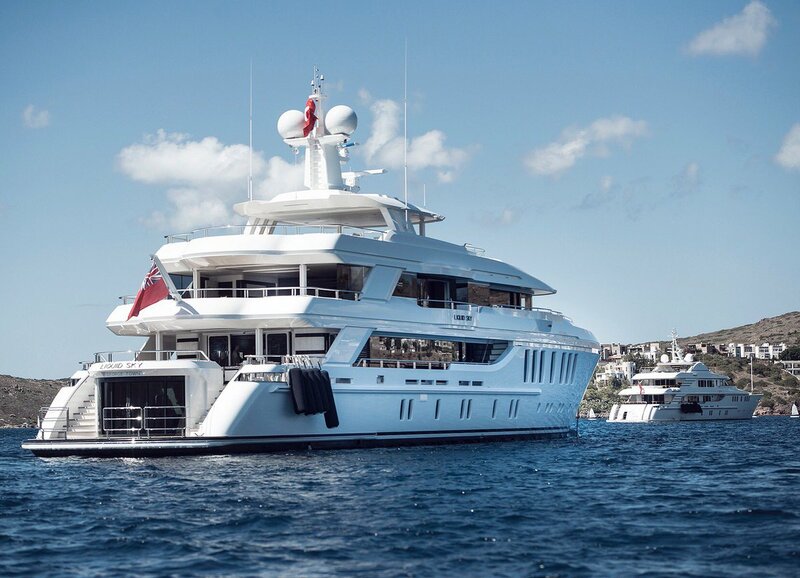 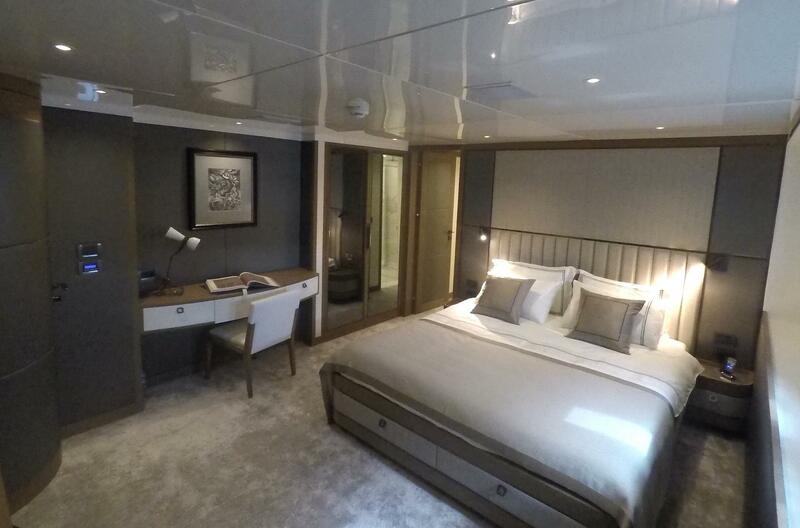 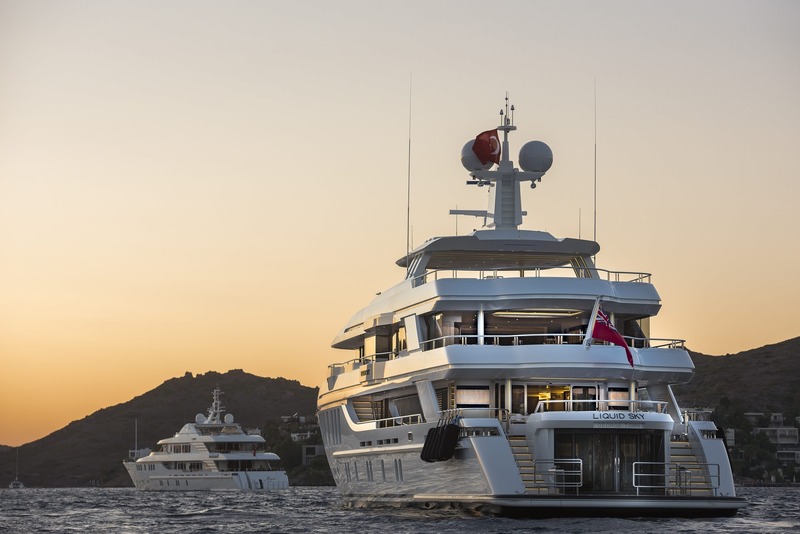 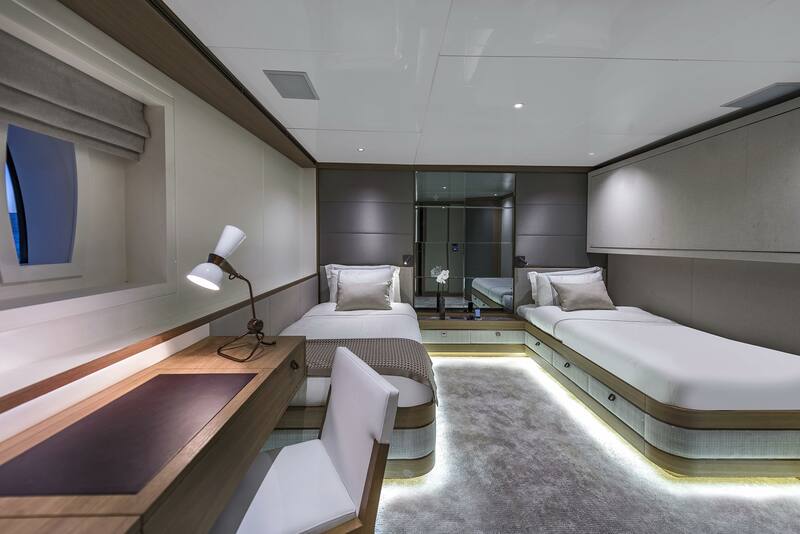 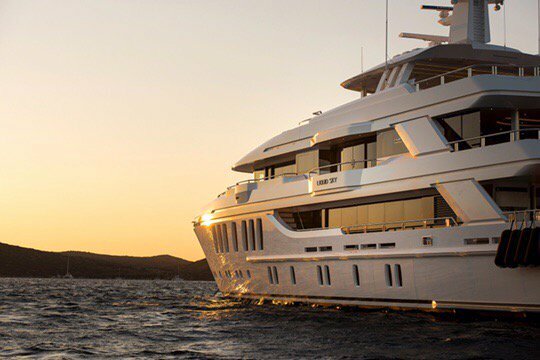 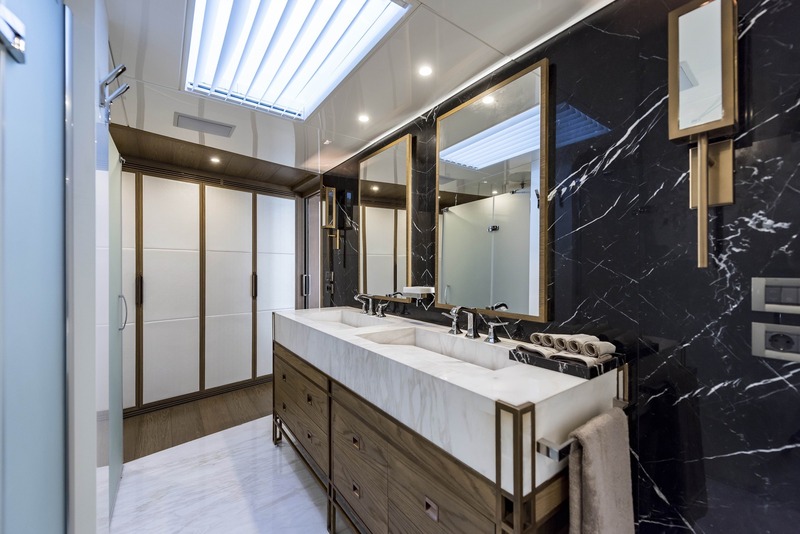 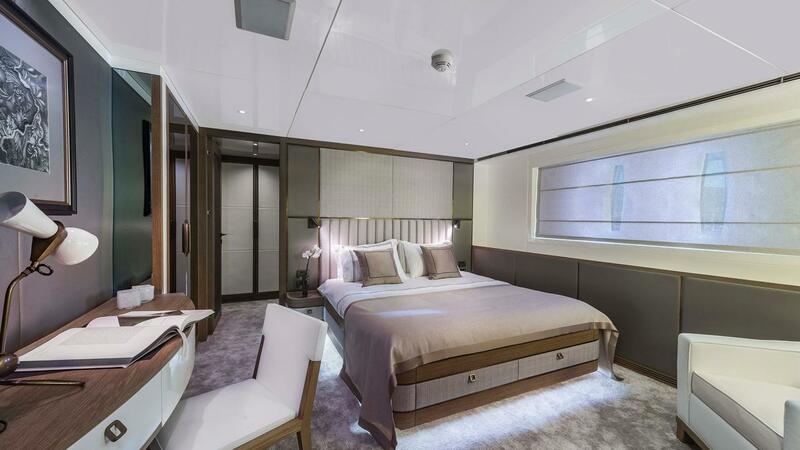 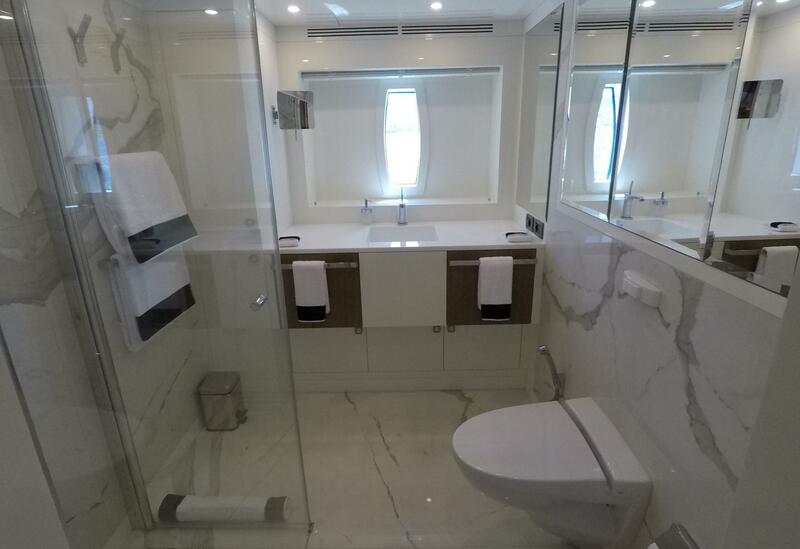 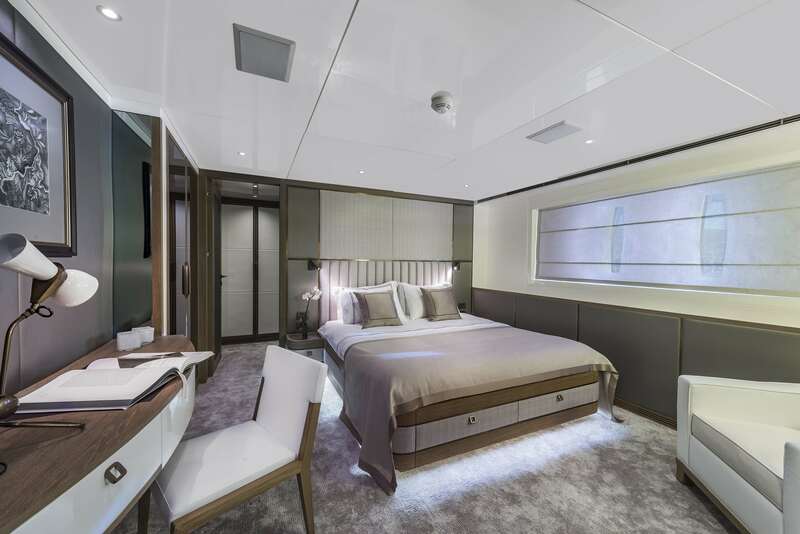 Accommodation is in 1 master stateroom on the main deck forward and full beam of the yacht, with a king size bed, his and hers walk-in wardrobes, study and large ensuite. 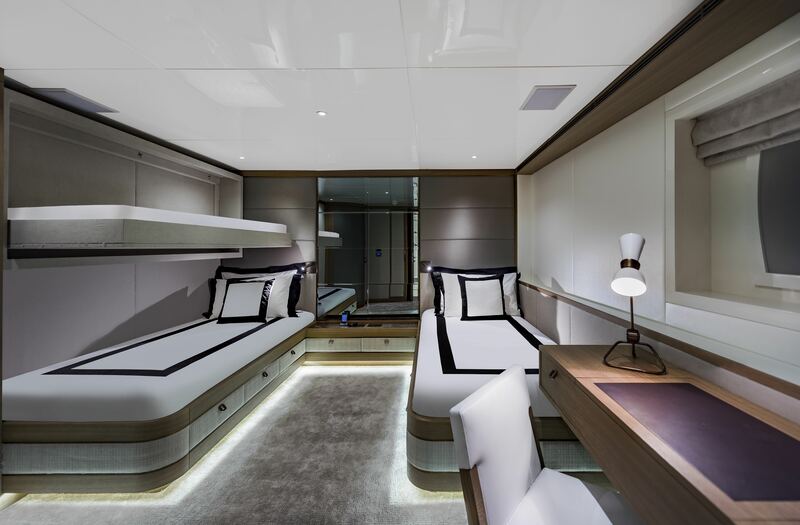 Below decks are a further 2 cabins with queen size beds and 2 twin cabins, offering side by side single beds, plus a Pullman berth each. 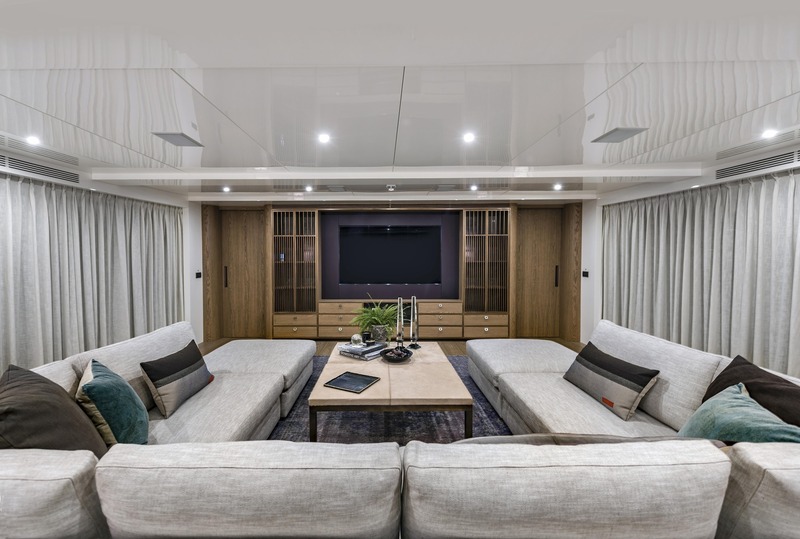 Her lower deck guest cabins all boast walk-in wardrobes, while all 5 cabins offer a safe, TV and audio entertainment systems and desk. 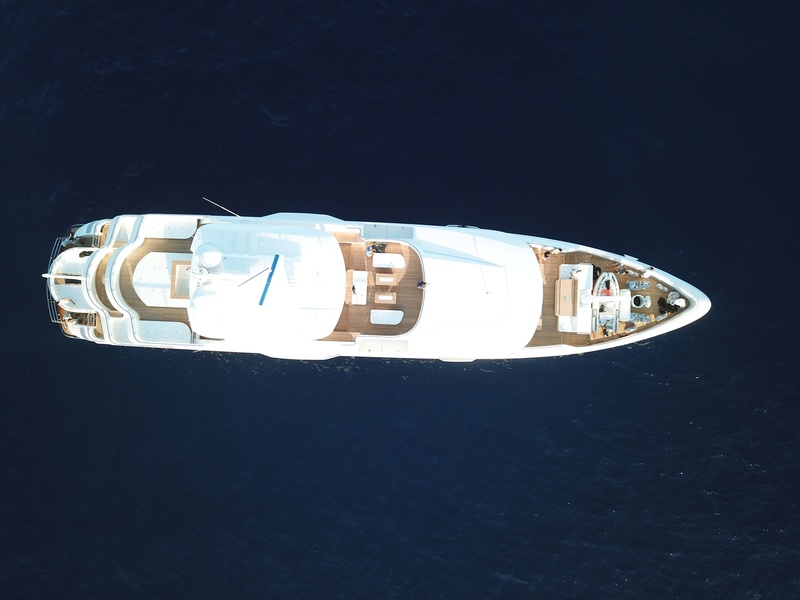 Tenders & Toys: 1 x Castoldi 19 FM (6m) 1 x Novurania Deluxe 400DL (13.1' / 4m) 1 x Wave-runner Seadoo Spark 1 x Stand-up Jetski Kawasaki 2 x Seabobs F5S (with camera integrated) 2 x SUP Paddle Boards 2 x Kayaks 1 x Donut 1 x Banana Water Skis Wake Board Snorkel equipment Fishing equipment Full gym equipment 2 x full diving sets. 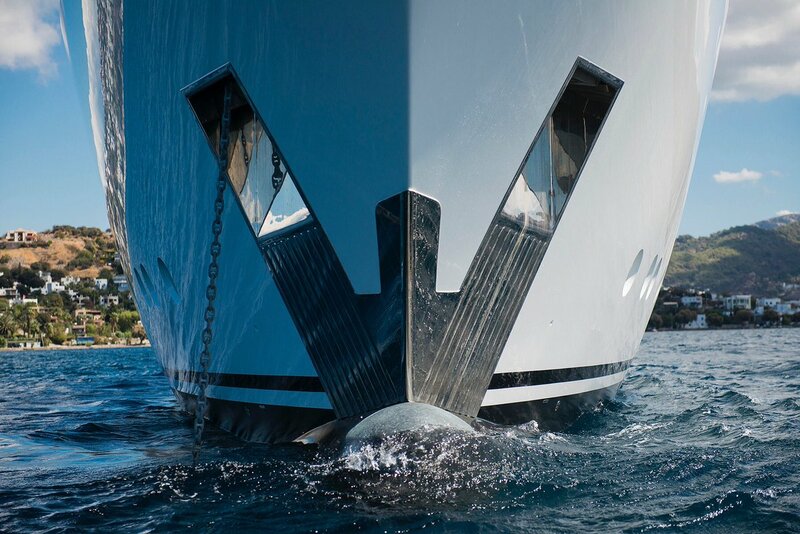 * Rendevouz diving only.